The Lansinoh Affinity double electric breast pump. Find out more about Brightworks' FEA optimsed design. and if it's new you are confronting problems and challenges you don't have references for." 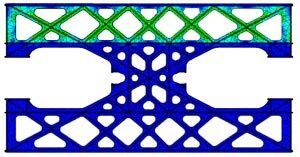 Finite Element Analysis (FEA) is a very useful computer based tool that can simulate how a product or component reacts to different real-world forces. This can be anything from vibration, temperature, fluid dynamics, and force. This tool can be used as an indication to whether a design will fail at a certain point or how it will react under a given load. This information is fed back into the design to improve its performance or strength. This ultimately provides confidence in a design before physical testing begins. Brightworks have used FEA on a number of projects to improve its design before going forward to prototyping and manufacture. Our knowledge of this analysis tool allows us to quickly identify potential weak points in a design, and how to efficiently modify it based on the information provided. In some cases specialist FEA engineers are collaborated with to ensure the best service for our clients.